We moved into our house in March after living in a condo for more than a year. It’s going to be our first winter in the house so we thought it would be nice to have some of our family and friends come over. I also wanted to do something different and fun. 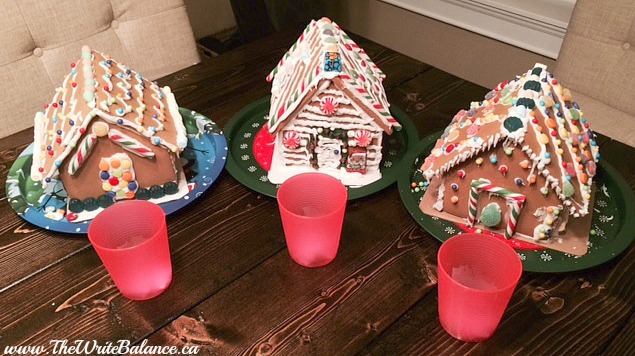 A few years back, when we were still living in Winnipeg, one of my husband’s collegue’s invited us over to make gingerbread houses. I remember having such a great time so I though that would be the perfect theme for the party. We sent out invitations and asked everyone to bring one of their favorite candy’s to add to their house decorations. 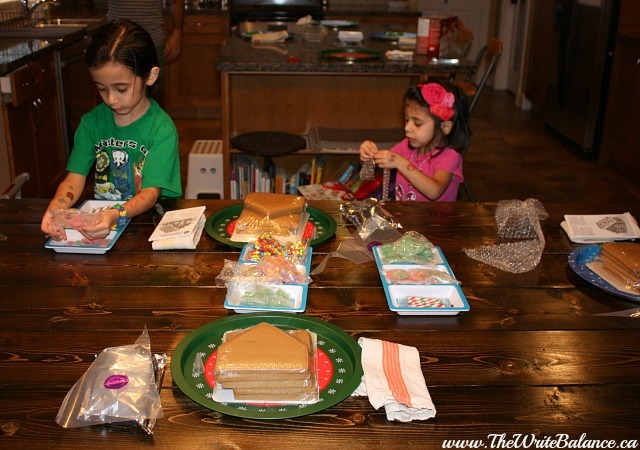 To prepare for the party, I stocked up on gingerbread house kits. I made sure to have holiday themed trays that the houses could be built on and then taken home with. We had multiple trays that could hold the candies, enough icing with piping bags and of course cloth napkins to wipe your hands with. Then on the afternoon of the party, the kids helped me set up all the stations, ensure that everyone had all the supplies and enough elbow room to create. Once everyone arrived, we got creating. To get the adults even more motivated we told them there would be prize for the most festive house. And it worked, everyone started decorating. It was a lot of fun to watch and not a single house looked the same. Each one was lovely, unique and of course delicious. Once the building was done, we took a short break for pizza and veggies. 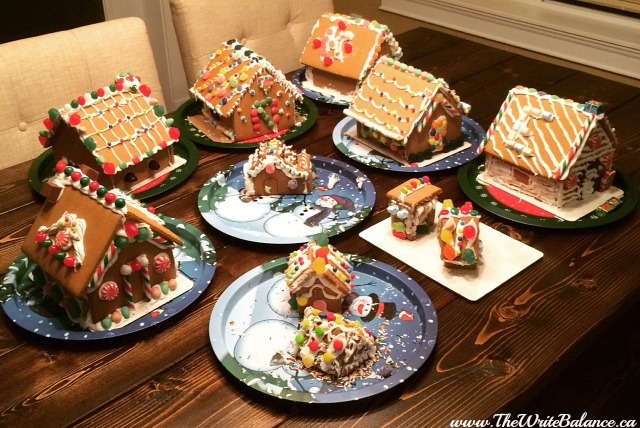 After everyone was rejuvenated, the hubby and I who were the impartial judges, picked three from all the fabulous gingerbread houses that we thought were the most festive. It was actually pretty hard to narrow it down. Then we put a cup in front of each finalist house and gave everyone a small piece of paper. They put the paper in in the cup in front of the house that was their favourite. 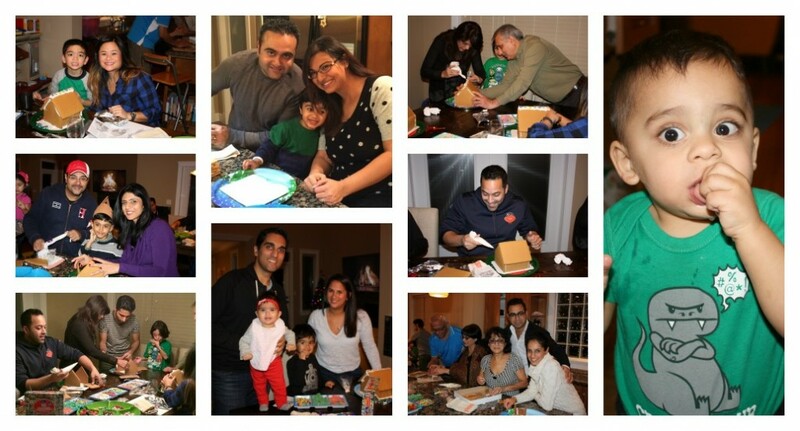 It was a pretty tight race and in the end, four-year old Shayan and his parents won. They got a new game of Scrabble and all the kids got a Christmas Activity Book because really, all their houses were winners! In the end, I think the party was a big success and most importantly, everyone had fun. I know this because I found out the next day that my mom had been saying that she had a lot of fun! 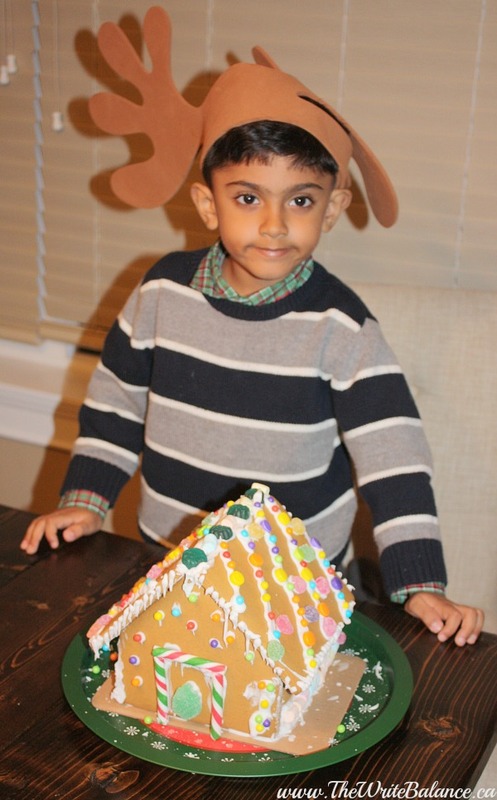 It had been her first time building a gingerbread house. 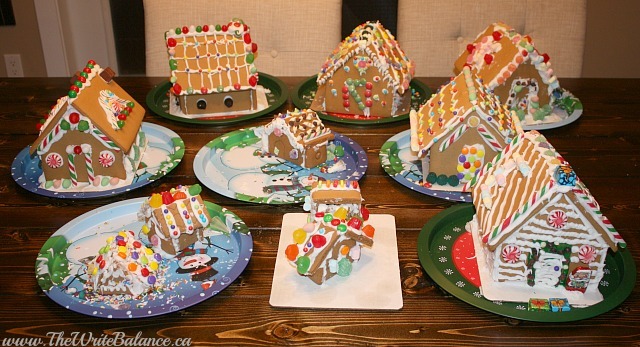 We have decided that this will be the first in an annual tradition of a Gingerbread House Making Party, something to look forward to every year! Do you have a holiday party, theme or tradition you uphold every year? What a great idea for a party! I love that this could be family-friendly or just a bunch of gals getting together! Sure looks like a great time! Do you know if they houses are eaten afterwards? The only thing I’d worry about is food waste. What a wonderful idea!! I might have to borrow this one from you! You definitely should borrow it Sarita! That looks like a lot of fun and they are pretty to look at too! Awesome idea my friend. Everyone looks very engaged and into the moment. Looks like a lot of fun. Your kids are so precious. Thanks for sharing. Merry Christmas!! We did make lots of great memories, thanks Nate. What a great idea. Looks like they had a blast making them! That’s a nice idea, Salma. I’m sure everyone enjoyed themselves. The houses all looked well done. Thanks for sharing.! It’s going to be a great tradition. These houses look amazing! Looks like you all had a good time: great idea! Actually this sounds very interesting, maybe I will also try something like this every year to feel deeply the festive season. Especially kids need such kind of creative fun activity. Thanks for suggesting.